Native bumblebees are attracted to bluebonnets. The largest of the bees, bumblebees are buzz pollinators. Their wings beat 130 times more per second than other pollinators, vibrating flowers until they release pollen. Plants produce more fruit through buzz pollination, according to the National Wildlife Federation. That’s why tomato growers prefer bumblebees. Mason bees love bluebonnets, depending on them for nectar and nourishment. The bluebonnets are just as dependent on these native Central Texas bees for their own existence. 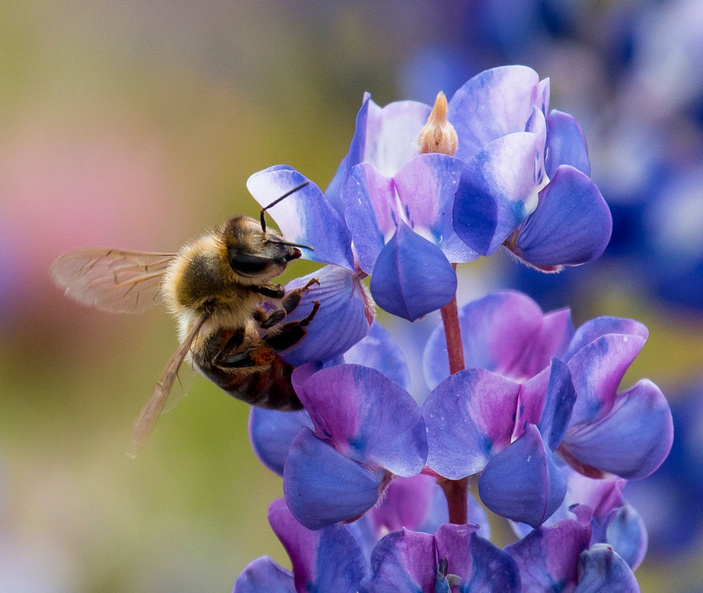 In fact, this particular species of bee hatches each year just in time to pollinate the white-spotted blooms that paint Highland Lakes pastures and roadways indigo. No mason bees, no bluebonnets. Nicknamed “orchard bees,” mason bees also love apple trees. The carefully synced life cycles of insect and plant include more than timing, especially when it comes to the State Flower of Texas. The legendary wildflower’s very essence — the smell it emits and even the small white dot on its blooms — draws in the exact creatures designed to help it propagate. While honeybees get the headlines, native bees, hidden away in tree trunks and burrowed into holes in the ground, actually do most of the work necessary for the existence of native plants. Honeybees, in fact, are responsible for only 30 percent of pollination worldwide. The other 70 percent is done mostly by native bees along with other pollinators such as butterflies, moths, and wasps. Honeybees, which were brought over on ships by the early settlers, are not as essential. Native bees far outnumber honeybees, are much faster, and visit more flowers, even in inclement weather, which sends honeybees back to the colony. Mason bees are among the fastest fliers and pollinators around. They have extremely hairy bodies, giving pollen plenty of places to stick — and fall off of — in nature’s all-important pollinating process. They are especially essential in keeping the Highland Lakes awash in bluebonnets every spring. Moving through that funnel are butterflies, bats, and birds, among other creatures,all of which live off the native species found in abundance here. “We are lucky to be here to experience all this diversity of nature,” Hutson continued. That diversity is kept alive and vibrant through the industrious drive of female native bees. Though they don’t store nectar or make honey, they do drink the nectar for energy while moving pollen from flower to flower. They also make food balls by mixing nectar and pollen, which are then stored with the eggs for nourishment. About 70 percent of the bees in Texas live in the ground. They are solitary insects, the opposite of honeybees. They are highly attuned to the changing seasons and, in particular, to the growth cycle of the plants on which they depend for food. Mason bees, so called because they live in underground burrows sealed with mortar-like clay, favor wildflowers, in particular bluebonnets. They are drawn to the plant by the white dot on its blue petals. As a flower runs out of nectar, each dot changes color from white to red, a shade bees cannot see. Bees can see into the ultraviolet range of the color spectrum, unlike humans. They are attracted to flowers with certain lines and patterns that act as landing pads for them: Think geranium flower petals, which have thin lines that converge on the center of the flower, guiding bees to the nectar. Flowers also give off pheromones that draw in certain bees or butterflies. They even have an electrical field to attract the right insects. Native bees do have one thing in common with their international cousins: The females do most of the work. The males hatch first, fly out, and establish a territory just as the female begins to hatch. She then comes out and picks a mate, which dies soon after the deed is done. The females gather pollen and nectar, build a nest, whether in a tree or a hole in the ground, and lay an egg. She seals it off and continues the process, laying egg after egg until she dies. Female eggs go in the hole first then males, which hatch first, starting the entire cycle again. Another major difference between native and honeybees can be found in the tail end — their stingers. Both have them, but only social bees, like honeybees are aggressive with them as they have a colony to defend. When disturbed near home base, a honeybee will sting. Native bees won’t sting unless they are unduly provoked or stepped on. Stingers differ as well. Honeybee stingers are barbed and stick in human hide. When the bee tries to remove its stinger, the delicate needle stays put, pulling out the bee’s insides eventually killing it. A native bee has no barbs on its stinger. It can sting multiple times and not die. One way to avoid a bee sting, other than not provoking the bee, is to forgo perfume or cologne when out in the garden or nature. All in all, bees are more in danger from us than we are from them, Hutson said. The loss of natural habitat through development and the use of pesticides and herbicideson farms and in gardens and yards has threatened the population of both types of bees. But don’t worry too much, said Hutson, who,as a Master Naturalist, decries the use of harmful chemicals on plants and insects. “We could go extinct before they do,” he said, which might be the best reason yet to protect our bees. Learn how to build a bee house in your garden. Fantastic article by Suzanne! We are incredibly lucky in the Highland Lakes to have so many knowledgeable people like Billy, Ricky, Martelle and others, willing and able to share what they know about the natural world. Keep up the great work Picayune!